It's always fun to look back at everything that has happened in the last year. I am not only reflective in my teaching life. Being reflective seeps into all aspects of my life. I believe it to be how I grow, I do something right and I think about how we can do that again...or better, and I do something not so great and I think, "Oops! That didn't work..." and figure out what I can change for next time. Last year I decided on three challenges in my reading life for 2011. I did pretty good! I chose these 12 books from my TBR list that I planned to read this year! I did it! I didn't get to reading Boneshaker BUT I did read Hold Me Closer, Necromancer which was on my alternates list so in total I read 12 books that were already on my TBR. I really liked this challenge! Incidentally, all of these were great reads! The goal for this challenge was to read more books in 2011 than I read in 2010, which is a goal I set for myself and shared with my students, so this was perfect for me. There were different levels for this challenge and I decided to go big! I did the "I'm on Fire!" level which means I planned to read 16+ more books than I read last year. In 2010, I read 125 books - that's only counting chapter books/novels/professional books not any picture books. The new goal was 141 or more! The year isn't quite over and I already surpassed my goal by a lot! Maybe I can make it to 200 by the end of the year! 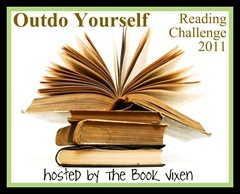 This challenge was all about stimulating the economy and supporting bookstores while at the same time stimulating reading. There were two levels for this challenge, the first level was buying one book and reading one book. The second level was buying 12 books throughout the year and reading those 12 books. I committed to the second level of books but then I didn't do a good job of keeping track of this. I know I bought lots of books and read them...the tricky part here is usually I read a book first and then decide if I want to buy it because I add them to my library for students to borrow from me. So does it count if I read it and then bought it? I was a bit backwards with this challenge and that made it hard for me to keep a good log of the books. Hooray! I feel totally excited that I met my goals this year. It definitely feels like a great accomplishment. I love looking back at all the books I read this year. I'm off to look for 2012 challenges...maybe a picture book or poetry challenge this year? On a side note, one of my other goals for myself for this year was to read more non-fiction and I really did read more non-fiction. I should create a pie chart with the genres I read...when I find some *extra* time or if I can get my hands on a time-stop button, I'll get on that. But I know I read more non-fiction and I loved it. It was fun to explore the different kinds of non-fiction there are and to really enjoy it! What challenges are you participating in for 2012? Share your favorites!